In work that someday may lead to the development of novel types of nanoscale electronic devices, an interdisciplinary team of researchers at the California Institute of Technology (Caltech) has combined DNA's talent for self-assembly with the remarkable electronic properties of carbon nanotubes, thereby suggesting a solution to the long-standing problem of organizing carbon nanotubes into nanoscale electronic circuits. 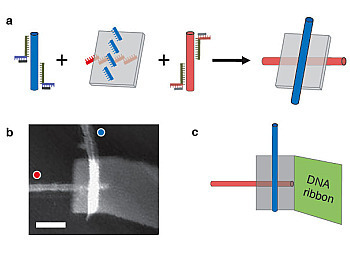 (a) Single-wall carbon nanotubes labeled with "red" and "blue" DNA sequences attach to anti-red and anti-blue strands on a DNA origami, resulting in a self assembled electronic switch. (b) An atomic force microscopey image of one such structure. The blue nanotube appear brighter because it is on top of the origami; the red nanotube sits below. Scale bar is 50 nm. (c) A diagrammatic view of the structure shown in b. The gray rectangle is the DNA origami. A self-assembled DNA ribbon attached to the origami improves structural stability and ease of handling. Credit: Paul W. K. Rothemund, Hareem Maune, and Si-ping Han/Caltech/Nature Nanotechnology. A paper about the work appeared November 8 in the early online edition of Nature Nanotechnology "This project is one of those great 'Where else but at Caltech?' stories," says Erik Winfree, associate professor of computer science, computation and neural systems, and bioengineering at Caltech, and one of four faculty members supervising the project. Both the initial idea for the project and its eventual execution came from three students: Hareem T. Maune, a graduate student studying carbon nanotube physics in the laboratory of Marc Bockrath (then Caltech assistant professor of applied physics, now at the University of California, Riverside); Si-ping Han, a theorist in materials science, investigating the interactions between carbon nanotubes and DNA in the Caltech laboratory of William A. Goddard III, Charles and Mary Ferkel Professor of Chemistry, Materials Science, and Applied Physics; and Robert D. Barish, an undergraduate majoring in computer science who was working on complex DNA self-assembly in Winfree's lab. The project began in 2005, shortly after Paul W. K. Rothemund invented his revolutionary DNA origami technique. At the time, Rothemund was a postdoctoral scholar in Winfree's laboratory; today, he is a senior research associate in bioengineering, computer science, and computation and neural systems. Rothemund's work gave Maune, Han, and Barish the idea to use DNA origami to build carbon nanotube circuits. DNA origami is a type of self-assembled structure made from DNA that can be programmed to form nearly limitless shapes and patterns (such as smiley faces or maps of the Western Hemisphere or even electrical diagrams). Exploiting the sequence-recognition properties of DNA base pairing, DNA origami are created from a long single strand of viral DNA and a mixture of different short synthetic DNA strands that bind to and "staple" the viral DNA into the desired shape, typically about 100 nanometers (nm) on a side. Single-wall carbon nanotubes are molecular tubes composed of rolled-up hexagonal mesh of carbon atoms. With diameters measuring less than 2 nm and yet with lengths of many microns, they have a reputation as some of the strongest, most heat-conductive, and most electronically interesting materials that are known. For years, researchers have been trying to harness their unique properties in nanoscale devices, but precisely arranging them into desirable geometric patterns has been a major stumbling block. "After hearing Paul's talk, Hareem got excited about the idea of putting nanotubes on origami," Winfree recalls. "Meanwhile, Rob had been talking to his friend Si-ping, and they independently had become excited about the same idea." Underlying the students' excitement was the hope that DNA origami could be used as 100 nm by 100 nm molecular breadboards—construction bases for prototyping electronic circuits—on which researchers could build sophisticated devices simply by designing the sequences in the origami so that specific nanotubes would attach in preassigned positions. "Before talking with these students," Winfree continues, "I had zero interest in working with carbon nanotubes or applying our lab's DNA-engineering expertise toward such practical ends. But, seemingly out of nowhere, a team had self-assembled with a remarkable spectrum of skills and a lot of enthusiasm. Even Si-Ping, a consummate theorist, went into the lab to help make the idea become reality." "This collaborative research project is evidence of how we at Caltech select the top students in science and engineering and place them in an environment where their creativity and imagination can thrive," says Ares Rosakis, chair of the Division of Engineering and Applied Science at Caltech and Theodore von Kármán Professor of Aeronautics and Professor of Mechanical Engineering. Bringing the students' ideas to fruition wasn't easy. "Carbon nanotube chemistry is notoriously difficult and messy—the things are entirely carbon, after all, so it's extremely difficult to make a reaction happen at one chosen carbon atom and not at all the others," Winfree explains. "This difficulty with chemically grabbing a nanotube at a well-defined 'handle' is the essence of the problem when you're trying to place nanotubes where you want them so you can build complex devices and circuits," he says. The scientists' ingenious solution was to exploit the stickiness of single-stranded DNA to create those missing handles. It's this stickiness that unites the two strands that make up a DNA helix, through the pairing of DNA's nucleotide bases (A, T, C, and G) with those that have complementary sequences (A with T, C with G). "DNA is the perfect molecule for recognizing other strands of DNA, and single-stranded DNA also just happens to like sticking to carbon nanotubes," says Han, "so we mix bare nanotubes with DNA molecules in salt water, and they stick all over the nanotubes' surfaces. However, we make sure that a little bit of each DNA molecule is protected, so that that little portion doesn't stick to the nanotube, and we can use it to recognize DNA attached to the DNA origami instead." The scientists created two batches of carbon nanotubes labeled by DNA with different sequences, which they called "red" and "blue." "Metaphorically, we dipped one batch of nanotubes in red DNA paint, and dipped another batch of nanotubes in blue DNA paint," Winfree says. Remarkably, this DNA paint acts like color-specific Velcro. "These DNA molecules served as handles because a pair of single-stranded DNA molecules with complementary sequences will wrap around each other to form a double helix. Thus," he says, "'red' can bind strongly to 'anti-red,' and 'blue' with 'anti-blue.'" "Consequently," he adds, "if we draw a stripe of anti-red DNA on a surface, and pour the red-coated nanotubes over it, the nanotubes will stick on the line. But the blue-coated nanotubes won't stick, because they only stick to an anti-blue line." To make nanometer-scale electronic circuits out of carbon nanotubes requires the ability to draw nanometer-scale stripes of DNA. Previously, this would have been an impossible task. Rothemund's invention of DNA origami, however, made it possible. "A standard DNA origami is a rectangle about 100 nm in size, with over 200 'pixel' positions where arbitrary DNA strands can be attached," Winfree says. To integrate the carbon nanotubes into this system, the scientists colored some of those pixels anti-red, and others anti-blue, effectively marking the positions where they wanted the color-matched nanotubes to stick. They then designed the origami so that the red-labeled nanotubes would cross perpendicular to the blue nanotubes, making what is known as a field-effect transistor (FET), one of the most basic devices for building semiconductor circuits. Although their process is conceptually simple, the researchers had to work out many kinks, such as separating the bundles of carbon nanotubes into individual molecules and attaching the single-stranded DNA; finding the right protection for these DNA strands so they remained able to recognize their partners on the origami; and finding the right chemical conditions for self-assembly. After about a year, the team had successfully placed crossed nanotubes on the origami; they were able to see the crossing via atomic force microscopy. These systems were removed from solution and placed on a surface, after which leads were attached to measure the device's electrical properties. When the team's simple device was wired up to electrodes, it indeed behaved like a field-effect transistor. The "field effect" is useful because "the two components of the transistor, the channel and the gate, don't actually have to touch for there to be a switching effect," Rothemund explains. "One carbon nanotube can switch the conductivity of the other due only to the electric field that forms when a voltage is applied to it." At this point, the researchers were confident that they had created a method that could construct a device from a mixture of nanotubes and origami. "It worked," Winfree says. "I can't say perfectly—there's lots of room for improvement. But it was sufficient to demonstrate the controlled construction of a simple device, a cross-junction of a pair of carbon nanotubes." "We expect that our approach can be improved and extended to reliably construct more complex circuits involving carbon nanotubes and perhaps other elements including electrodes and wiring," Goddard says, "which we anticipate will provide new ways to probe the behavior and properties of these remarkable molecules." The real benefit of the approach, he points out, is that self-assembly doesn't just make one device at a time. "This is a scalable technology. That is, one can design the origami to construct complex logic units, and to do this for thousands or millions or billions of units that self-assemble in parallel." The work in the paper, "Self-assembly of carbon nanotubes into two-dimensional geometries using DNA origami templates," was supported by the National Science Foundation, the Office of Naval Research, and the Center on Functional Engineered Nano Architectonics. Fujitsu Limited (Kawasaki, JP) researchers discovered a way to grow curved carbon nanotubes. With curves, the freedom of shape is improved and the range of application is widened, say inventors Akio Kawabata, Mizuhisa Nihei, Daiyu Kondo and Shintaro Sato. 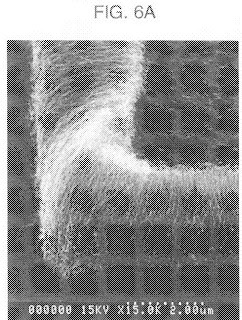 After forming an opening, a resist film is formed on the entire surface and a resist pattern is formed by patterning the resist film. The shape of the resist pattern is such that it covers one side of the bottom of the opening. As a result, a Si substrate is exposed only in one part of the opening. Then, using the resist pattern as a mask, a catalytic layer is formed on the bottom of the opening. Then, the resist pattern is removed. Carbon nanotubes are grown on the catalytic layer. At this time, since the catalytic layer is formed on only one side of the bottom of the opening, the Van der Waals force biased towards that side works horizontally on the growing carbon nanotubes. 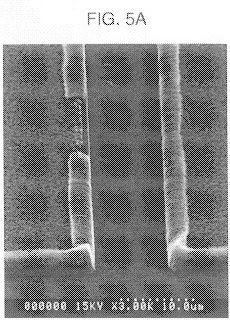 Therefore, the carbon nanotubes are attracted towards the nearest side of the SiO2 film and grow biased towards that side. FIG. 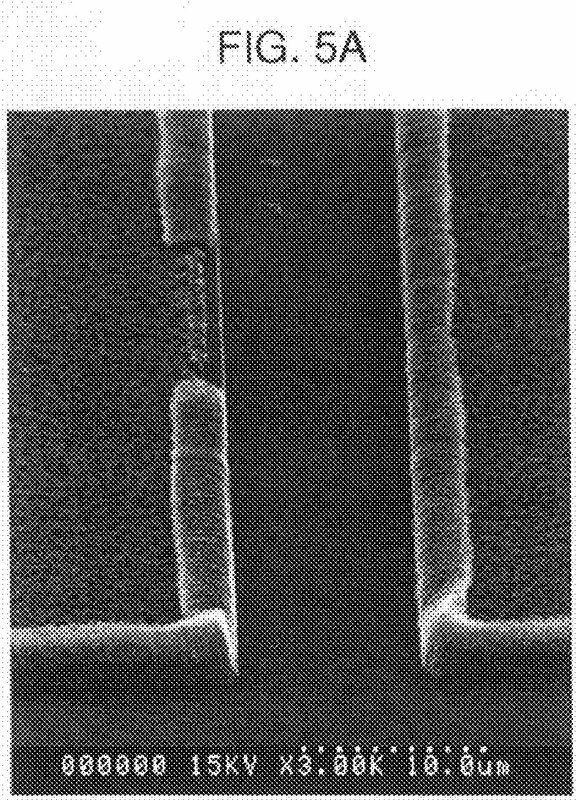 5A is an SEM photograph showing carbon nanotubes grown from a T-shaped groove in plane view; the carbon nanotubes are suitable for integrated circuits. Asahi Glass Company, Limited (Chiyoda-ku, JP) developed a fuel cell membrane using carbon nanotubes that exhibits superior performance in both humid and low humidity environments. Solid polymer electrolyte fuel cells are required to be operated under a low humidity environment, primarily in their use for automobiles. 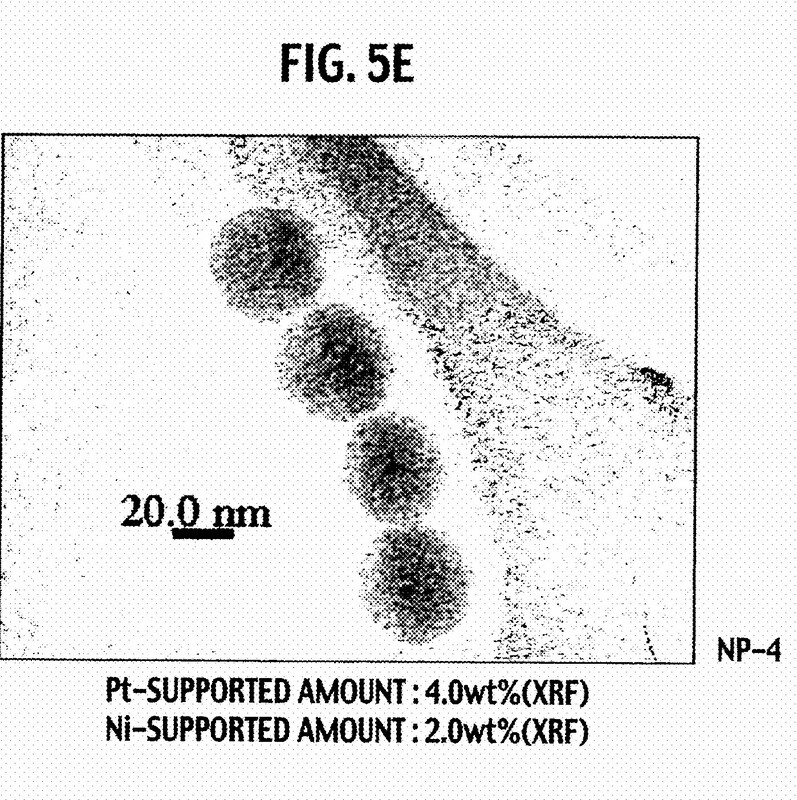 The nanocarbon material exhibits high proton conductivity in a low humidity environment for a proton-conductive polymer used in a fuel cell membrane electrode assembly, according to U.S. Patent Application 20090291345. Carbon nanofiber is particularly preferred since it is fine and has excellent electron conductivity. The carbon nanofiber may be a vapor-grown carbon fiber, carbon nanotube single wall, double wall, multiwall or cup-laminated type. 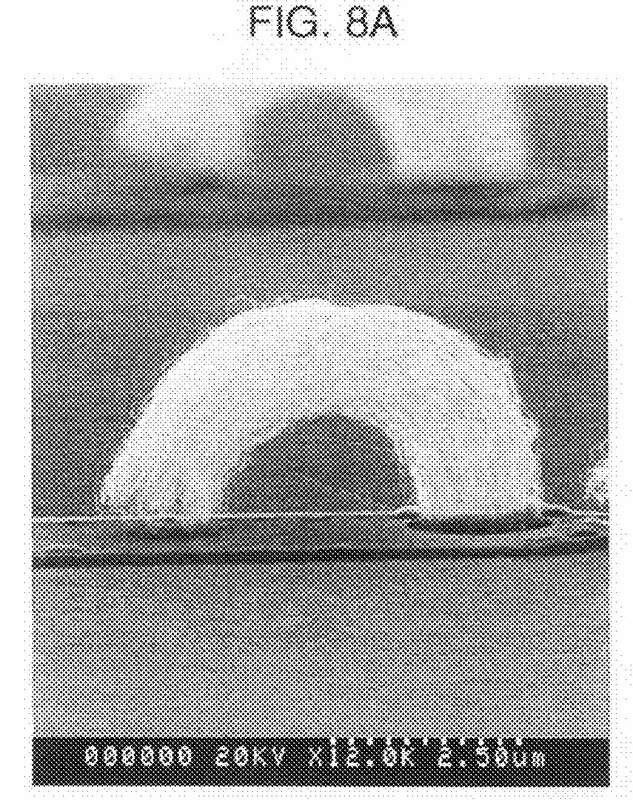 By providing an interlayer composed mainly of carbon fiber between the catalyst layer and the gas diffusion layer, water is readily transferred by a capillary phenomenon from the catalyst layer to the interlayer whereby a flooding problem during the operation of the polymer electrolyte fuel cell may readily be solved say inventors Satoru Hommura, Shinji Kinoshita, Hiroshi Shimoda, Susumu Saito, Seigo Kotera, Tetsuji Shimohira and Hideki Nakagawa. The fiber diameter of the carbon fiber is preferably from 50 to 200 nm, and the fiber length is preferably from 1 to 50 microns. By using such carbon fiber, it entangles with an electron-conductive material (platinum or a platinum alloy, and a carbon carrier) contained in the catalyst layer at the interface between the interlayer 1-84 and the catalyst layer to form a new electroconductive path in addition to an electroconductive path by a point contact with the electroconductive material, whereby the electron conductivity of the catalyst layer will be improved. Further, such carbon fiber is likely to be entangled to form void spaces at the time of applying a coating fluid containing the carbon fiber, whereby such void spaces will function as a gas channel. The ratio of the carbon material to the proton-conductive polymer (carbon material/proton-conductive polymer) is preferably from 1/0.1 to 1/5 (mass ratio), more preferably from 1/0.2 to 1/1. Within such a range, the dispersibility of the carbon material, the adhesion between the interlayer and the gas diffusion layer, and the gas diffusing property and water-discharging property of the interlayer will be good. In actual driving of an automobile having a polymer electrolyte fuel cell mounted, the polymer electrolyte membrane will be exposed to various humidity environments. As a test to simulate such a situation, a cycle test (hereinafter referred to as a moistening/drying cycle test) has been proposed wherein the polymer electrolyte membrane is repeatedly exposed to each of a dried environment with a relative humidity of at most 25% and a moistening environment with a relative humidity of 100%. 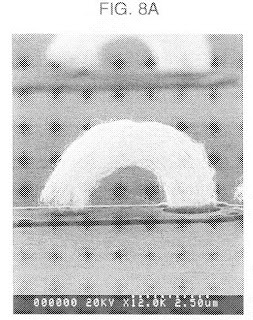 In such a moistening/drying cycle test, the polymer electrolyte membrane swells in the moistening environment and shrinks in the dried environment and thus undergoes swelling and shrinkage repeatedly along with moistening and drying cycles and thus undergoes a dimensional change especially in a planar direction. Therefore, by the moistening/drying cycle test, it is possible to evaluate the mechanical durability of the membrane/electrode assembly in an environment where moistening and drying are repeated. In order to improve the proton conductivity of the proton-conductive polymer, the ion exchange capacity may be increased. However, if the ion exchange capacity is increased, the water content of the proton-conductive polymer will increase. If the water content of the proton-conductive polymer to be used for the catalyst layer becomes too high, the proton-conductive polymer will swell and clog void spaces in the catalyst layer, thus leading to a problem of a so-called flooding phenomenon. If the flooding phenomenon takes place, the diffusion of the gas supplied to the catalyst layer decreases, whereby the power generation performance of the polymer electrolyte fuel cell will be substantially deteriorated. Asahai Glass says their membrane solves the flooding problem. An iRAP study identified 3,870 organizations involved in fuel cells, hydrogen energy and related nanotechnology who earned and spent an estimated $8.4 billion in 2008. 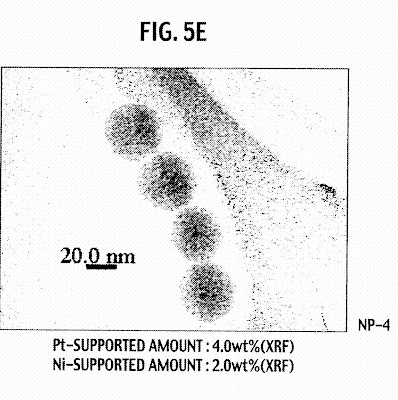 In U.S. Patent Application 20090291352, Nissan and Kyushu University, National University Corporation researchers reveal a superior electrode materials for proton exchange membrane fuel cells using platinum and nickel catalyst supported on carbon nanotubes. Scientists at the Massachusetts Institute of Technology (Cambridge, MA) will develop a paradigm shifting new "all liquid metal" grid scale battery for low cost, large scale storage of electrical energy. If this project is successful, this new class of batteries will allow the U.S. to regain technology leadership in grid scale energy storage and enable constant energy supply from intermittent renewable energy sources, such as wind and solar power, and will enable their widespread deployment on the U.S. grid to drastically reduce greenhouse gas emissions. Eagle Picher (Joplin, MO), in partnership with the Pacific Northwest National Laboratory, will develop a new generation of high energy, low cost planar liquid sodium beta batteries for grid scale electrical power storage applications. This new generation of batteries could vault the U.S. into global leadership in grid scale energy storage and enable continuous power from intermittent renewable resources, like wind and solar power, to allow them to be integrated into the U.S. grid in large quantities to drastically reduce greenhouse gas emissions while maintaining a highly stable and reliable grid. FastCAP SYSTEMS (Cambridge, MA), in collaboration with the Massachusetts Institute of Technology, will develop a game changing new nanotube enhanced ultracapacitor with potential for a 6x improvement in energy density and cost over the current industry state-of-the art. These novel energy storage devices have potential for energy densities approaching those of batteries (33-44 Wh/kg), while providing 20x higher power density and thousands of times the cycle life of existing high performance batteries. If successfully developed, this transformational new energy storage technology would greatly reduce the cost of hybrid and elecricelectric vehicles to enable their widespread cost effective deployment in the U.S. and dramatically reduce U.S. oil imports. This technology also holds great promise to enable continuous power from intermittent renewable resources, like wind and solar, to allow them to grow to a large fraction of grid power while maintaining a stable and highly reliable grid. Arizona State University (Tempe, AZ), in partnership with Fluidic Energy, Inc., will seek to develop a new class of ultra-high energy new metal-air batteries using advanced ionic liquids. With a target energy density of 6-20 times that available state-of-the-art Li-ion batteries and at < 1/3 the cost, if this project is successful it will create a gamechanginggame changing new battery technology that will enable rapid and widespread deployment of long range, low cost plug-in hybrid and all-electric vehicles, shifting U.S. transport energy to the grid and drastically reducing U.S. oil imports. Inorganic Specialists, Inc. (Miamisburg, OH), in partnership with Ultramet, Inc., Eagle Picher, Southeast Nonwovens, and the Edison Materials Technology Center, will develop ultra high capacity battery anodes for next generation Li-ion batteries (3x the state-of-the art) based on a novel low cost silicon-coated carbon nanofiber paper. If successful, this low cost manufacturable new battery technology could rapidly accelerate the deployment of cost-effective plug-in hybrids and electric vehicles, shifting U.S. transportation energy to the grid and dramatically lowering U.S. oil imports. Envia Systems (Hayward, CA), in collaboration with Argonne National Laboratory, will develop high energy density, low cost next generation Li-ion batteries using novel nano silicon-carbon composite anodes and high capacity manganese rich layered composite cathodes discovered at Argonne National Laboratory. These batteries, if successfully developed, could triple the energy density of existing electric vehicle batteries (target: 400 Wh/kg) and rapidly hasten adoption of low cost plug-in hybrids and electric vehicles. HP announced new inertial sensing technology that enables the development of digital micro-electro-mechanical systems (MEMS) accelerometers can detect a 10 femtometer change in the position of its center chip. That’s less than one-billionth the width of a human hair. As a result, it can measure changes to acceleration in the micro-gravity range. That’s about 1,000 times more sensitive than accelerometers used in a Wii, an iPhone or an automobile’s airbag system. HP Labs senior researcher Peter Hartwell holds a prototype of a sensor network node incorporating the new MEMS accelerometer from HP. The first to be deployed as part of HP Labs’ Central Nervous System for Earth (CeNSE), it is about 1,000 times more sensitive than today’s mass-produced devices. A MEMS accelerometer is a sensor that can be used to measure vibration, shock or change in velocity. By deploying many of these detectors as part of a complete sensor network, HP will enable real-time data collection, management evaluation and analysis. This information empowers people to make better, faster decisions, and take subsequent action to improve safety, security and sustainability for a range of applications, such as bridge and infrastructure health monitoring, geophysical mapping, mine exploration and earthquake monitoring. The new sensing technology represents a breakthrough in nano sensing research and uses the fluidic MEMS technology co-developed over the past 25 years by HP Labs – the company’s central research arm – and the company’s Imaging and Printing Group. The HP sensing technology enables a new class of ultrasensitive, low-power MEMS accelerometers. Up to 1,000 times more sensitive than high-volume, commercial products, sensors based on this technology can achieve noise density performance in the sub 100 nano-g per square root Hz range to enable dramatic improvements in data quality. The MEMS device can be customized with single or multiple axes per chip to meet individual system requirements. The sensing technology is a key enabler of HP’s vision for a new information ecosystem, the Central Nervous System for the Earth (CeNSE). Integrating the devices within a complete system that encompasses numerous sensor types, networks, storage, computation and software solutions enables a new level of awareness, revolutionizing communication between objects and people. “With a trillion sensors embedded in the environment – all connected by computing systems, software and services – it will be possible to hear the heartbeat of the Earth, impacting human interaction with the globe as profoundly as the Internet has revolutionized communication,” said Peter Hartwell, senior researcher, HP Labs. Sensor nodes, however, are only part of the challenge of CeNSE. “How do you capture and use all that data?” asks Hartwell. At a typical data rate, one million sensors running 24 hours a day would require 50 hard disks running in parallel to capture the 20 petabytes of data created in just six months. “The amount of data we’re talking about here is ferocious,” says Williams. Then it has to be crunched to extract meaningful information. No matter how many gigabytes of data a smart highway might deliver, for example, “you’re only interested in one bit when you walk out that door,” says Hartwell. “Just one bit: Which interstate highway will take you home fastest? If it saves you 20 minutes on your commute, that one bit is worth a lot,” he points out. CeNSE’s first applications will make living on the planet safer and more convenient. But as the network grows, the breadth and detail of information it gathers could be critical to Earth’s survival, says Hartwell. “If we’re going to save the planet, we’ve got to monitor it,” says Hartwell. “We have to understand how we’re impacting the planet,” he says, pointing out that we don’t understand how wind farms may affect rainfall or how a cooling sea changes wind currents. Hartwell imagines people volunteering their sensors to feed data to climate change models, just as unused compute cycles are unfolding proteins and unraveling genomes today. A video of the technology is also available. The Department of Energy at the end of October announced major funding for 37 ambitious research projects - including some that could allow intermittent energy sources like wind and solar to provide a steady flow of power, or use bacteria to produce automotive fuel from sunlight, water and carbon dioxide. ARPA-E was originally established under the America Competes Act of 2007. In April of this year, President Obama announced $400 million in initial funding for ARPA-E through the American Recovery and Reinvestment Act. The $151 million in funding is being awarded through the Department's recently-formed Advanced Research Projects Agency-Energy ("ARPA-E"). 's mission is to develop nimble, creative and inventive approaches to transform the global energy landscape while advancing America's technology leadership. This is the first round of projects funded under ARPA-E, which is receiving total of $400 million under the American Recovery and Reinvestment Act. In announcing the selections, Secretary Chu said: "After World War II, America was the unrivaled leader in basic and applied sciences. It was this leadership that led to enormous technological advances. ARPA-E is a crucial part of the new effort by the U.S. to spur the next Industrial Revolution in clean energy technologies, creating thousands of new jobs and helping cut carbon pollution." The grants will go to projects with lead researchers in 17 states. Of the lead recipients, 43% are small businesses, 35% are educational institutions, and 19% are large corporations. In supporting these teams, ARPA-E seeks to bring together America's brightest energy innovators to pioneer a low cost, secure, and low carbon energy future for the nation. This first ARPA-E solicitation was highly competitive and oversubscribed, with over 3,600 initial concept papers received. Of those, approximately 300 full applications were requested and ultimately 37 final awardees through a rigorous review process with input from multiple review panels composed of leading U.S. energy science and technology experts and ARPA-E's program managers. Evaluations were based on the potential for high impact on ARPA-E's goals and scientific and technical merit. The project selections can be found in the table below. Renewable Power (solar) "Direct Wafer" technology to form high efficiency "monocrystalline-equivalent" silicon wafers directly from molten silicon, with potential to halve the installed cost of solar photovoltaics. Energy Storage A new class of metal-air batteries using ionic liquids, with many times the energy density of today's lithium-ion batteries. Could enable long range, low cost plug-in hybrid and all-electric vehicles. Direct Solar Fuels Cyanobacteria that produce and secrete fatty acids for biofuel feedstock using just sunlight, water, and carbon dioxide as inputs. Biomass Energy Genes that enable energy crops to produce more biomass using less land (and lower quality land), less water, and less fertilizer than standard energy crops. This approach would provide sustainable biofeedstocks to displace oil and coal for fuels and power production. Vehicle Technologies New power electronics technology based on a Gallium Nitride on Silicon process with innovative thermal management that can enable up to 50% more efficient power delivery from batteries to electric motors. Biomass Energy Production of bio-butanol, an advanced biofuel, from macroalgae (seaweed). Seaweed is a potentially sustainable and scalable new source of biomass that doesn't require arable land or potable water. Energy Storage High energy, low cost planar liquid sodium beta batteries for grid scale electrical power storage. Could enable continuous power from renewable resources, like wind and solar, and could support a highly stable and reliable grid. Energy Storage High energy density Lithium-ion batteries with 3x better energy density than current batteries. Based on novel nano silicon-carbon composite anodes and manganese composite cathodes discovered at Argonne National Laboratory. Could lower the cost and speed the adoption of plug-in hybrids and electric vehicles. Conventional Energy A novel catalyst to convert the olefins in refinery off-gas, which is currently flared and lost, into high-octane alkylate fuel. Could enable recovery up to 45 million barrels per year of gasoline. Energy Storage A nanotube enhanced ultracapacitor with energy density approaching that of standard batteries, but with many times greater power density and thousands of times the cycle life. Could greatly reduce the cost of hybrid and electric vehicles and of grid-scale storage. Renewable Power (wind) A new high efficiency shrouded wind turbine able to deliver significantly more energy per unit of swept area. Could also reduce noise and safety concerns, enabling distributed wind applications. Renewable Power (geothermal) A new hybrid thermal/mechanical drilling technology for much faster drilling with less wear and tear on the drill bit. Could open up cost effective access to the geothermal energy in deep, hard basement rock, a potentially huge new source of domestically available, carbon-free baseload power. Vehicle Technologies A shape memory alloy (SMA) energy recovery device to convert waste heat from car engines into electricity. Could significantly increase fuel efficiency in cars (most energy is lost as heat) and could be used in many other heat recovery applications. Energy Storage A silicon-coated carbon nanofiber paper for the anode of next generation Lithium-ion batteries. These low cost, manufacturable batteries could accelerate the deployment of plug-in hybrids and electric vehicles, shifting U.S. transportation energy from imported oil to the grid. Direct Solar Fuels Metabolic engineering and synthetic biology approaches to increase lipid production, carbon dioxide uptake, and thermal tolerance of algae for the production of biofuels directly from sunlight and CO2. Could make algae-based biofuels production economically viable. Building Efficiency Solid-state electrochromic film on plastic substrates with roll-to-roll production process to substantially reduce the cost of electrically controlled smart windows for net-zero energy buildings. These windows reduce heating and cooling loads and minimize overhead lighting use. Carbon Capture Electric field swing adsorption for carbon capture using high surface area conductive solid carbon sorbents. Uses electric fields to change the interaction of molecules on a surface, capturing and then releasing the CO2 using far less energy than current approaches. Energy Storage An all liquid metal grid-scale battery for low cost, large scale storage of electrical energy. This new class of batteries could enable continuous power supply from renewable energy sources, such as wind and solar and a more stable, reliable grid. Vehicle Technologies The wave disc engine, a gas-fueled electric generator that is five times more efficient than traditional engines for electricity production, as well as lighter and cheaper to manufacture. Could replace current generators for plug-in hybrid electric vehicles. Building Efficiency A high-pressure ammonothermal process for the inexpensive production of high quality, single crystal GaN substrates at high crystal growth rates. Could allow production of light emitting diodes (LEDs) at costs equal to current low-cost fluorescent lighting. LED lighting consumes as little as one tenth of the energy of current lighting options. Carbon Capture An electrochemical process for CO2 capture using Resin-Wafer Electrodeionization. Uses pH changes to adsorb and desorb CO2 from flue gas without energy intensive, costly processes such as heating or a vacuum. Water Carbon nanotubes for reverse osmosis membranes that require less energy and have many times higher flux. Could dramatically reduce the cost and energy required for desalination to supply fresh water for our crops and communities. Carbon Capture Syngas Chemical Looping (SCL) to convert coal or biomass into electricity while efficiently capturing the CO2. Has successfully been demonstrated at laboratory scale; this project will scale it up to a pilot plant at the National Carbon Capture Center. Renewable Power (wind) "Blown Wing" technology for wind turbines. Creates a virtual airfoil by jetting compressed air along a wing. Can be dynamically adjusted to maximize power under a wide range of wind conditions. A new design that can be manufactured at a fraction of the cost. Direct Solar Fuels Catalyst-coated titanium dioxide nanotube membranes to convert sunlight, carbon dioxide and water into methane and other hydrocarbon fuels. Waste Heat Capture A new class of high efficiency thermoelectric devices and materials that use thermally insulating semiconductors with high thermal-to-electric conversion efficiencies. An astounding [60%] of U.S. energy is lost in the form of waste heat - from power plants, industrial processes, and vehicles. High efficiency thermoelectrics hold great promise to tap into this vast hidden energy resource while reducing U.S. greenhouse gas emissions. Carbon Capture Carbon nanotubes integrated into polymer membranes to increase the flux of CO2 capture membranes by two orders of magnitude. Could enable much less expensive carbon capture from coal plants. Biomass Energy A single-step catalytic biomass pyrolysis process with high carbon conversion efficiency to produce a stable bio-crude "oil" with low oxygen content. The approach combines pyrolysis oil production, stabilization, and upgrading into one process. Building Efficiency Sensors, software, and controls to track and improve energy use patterns. Could lead to substantial reductions in building energy use by changing human behavior through timely information and usable controls. Direct Solar Fuels / Energy Storage A novel catalyst to greatly enhance the efficiency of splitting water into hydrogen and oxygen. An important platform technology for the production of solar fuels and for distributed energy storage systems. Carbon Capture Synthetic enzymes for capturing CO2 from coal plant flue gas streams. Uses a synthetic form of the enzyme carbonic anhydrase, which our bodies use to remove CO2. Could dramatically reduce the cost of carbon capture. Biomass Energy / Direct Solar Fuels A novel algae harvesting system that could dramatically reduce the energy cost necessary to harvest, dewater, and dry algae by using a novel absorbent moving belt harvester. This technology offers the potential to transform the economics of algae-based biofuel production by removing a major barrier to large scale commercialization. Vehicle Technologies Alkaline polymer electrolyte fuel cell membranes that eliminate the use of expensive catalyst materials. Potential to drastically reduce fuel cell costs and enable their widespread application in building and automotive applications. Vehicle Technologies Novel high energy density, low rare-earth content magnetic materials with double the energy density of current materials. Would decrease the weight and increase the efficiency of motors for hybrid, plug-in hybrid, and electric vehicles and generators for advanced wind turbines. Also could greatly reduce U.S. imports of key rare-earth elements that are not domestically available. Waste Heat Capture A novel thermoelectric waste heat harvesting device based on large area arrays of 1-D concentric silicon nanotubes. Can be inexpensively printed as stacked thermoelectric junctions. This low cost thermoelectric technology holds great promise to allow the U.S. to begin to harvest the more than 60% of its energy that it loses in the form of waste heat. Direct Solar Fuels Production of liquid hydrocarbon transportation fuels directly from sunlight, water and CO2 using an artificial symbiotic colony of photosynthetic cyanobacteria and Shewanella, a hydrocarbon producing bacteria. A Porifera led team will develop carbon nanotube membranes for energy efficient carbon capture. The research and development will be funded by the newly formed Advanced Research Project Agency – Energy. ARPA-E will fund development of carbon nanotube membranes with fluxes up to 100x higher than the conventional membranes. Physical and chemical modifications to the carbon nanotubes will be used to increase the selectivity of the membrane for CO2. The program objective is to demonstrate a more efficient and economical means of carbon capture over current state of the art amine technology. Porifera will receive $1.1M over two years. Porifera team is led by Dr. Olgica Bakajin, and includes Senior Scientists Dr. Sangil Kim and Dr. Jennifer Klare. Porifera’s partners are Prof. Grigoropolous’s group at the University of California, Berkeley and Lawrence Livermore National Laboratory team led by Dr. Aleksandr Noy that includes a Staff Scientist Dr. Francesco Fornasiero. “It’s the first time that this kind of grant has been given. Competition was though. Only about 1% of the submitted proposals was funded.” Dr. Noy said. “It’s on us to show that ARPA-E funding will lead to true game changing technologies “, added Bakajin. ARPA-E’s mission is to develop nimble, creative and inventive approaches to transform the global energy landscape, while advancing America’s technology leadership. Porifera Inc. is a San Francisco Bay Area based company whose goal is commercialization of carbon nanotube membrane technology. Porifera combines groundbreaking research advances with solid technological and marketing expertise to develop solutions that will revolutionize the membrane industry and provide clean drinking water and air free of pollutants. MagForce Nanotechnologies AG (Berlin , Germany) has submitted the product file for NanoTherm® to Medcert GmbH, the medical certification and testing company which serves as Notified Body for the certification of medical products. With this step, MagForce has now commenced the conformity assessment procedure for its Nano-Cancer® therapy. Following successful completion of this conformity assessment procedure and EC type testing of the magnetic field applicator, MagForce will be able to apply the CE European conformity marking and to market its Nano-Cancer® therapy throughout the European Union. In early November, the results of a pivotal clinical trial were published demonstrating the efficacy of the new therapy in patients with recurrent glioblastoma, and it is upon these results that the application for European regulatory approval is based. The primary study objective, which was to extend the median survival time following tumor recurrence by three months compared to a historical control group, was significantly exceeded in the actual results. Following treatment with Nano-Cancer® and accompanying radiotherapy, the median survival time following diagnosis of the first tumor recurrence was 13.4 months. Compared to the 6.2-month median survival time following recurrence observed in a recently published EORTC study, the patient survival time was shown to be statistically highly significant longer (p-value < 0.01). "With the glioblastoma study successfully concluded and the product file now submitted for review, we have attained our most important objectives for this year, which we are of course extremely pleased about," said Dr. Uwe Maschek, CEO of MagForce Nanotechnologies AG. "We are confident that we are on a solid course to complete the certification procedure for our Nano-Cancer® therapy in the first half of 2010. Over the months ahead, we will thus be able to concentrate our resources entirely on preparations for the commercialization phase."